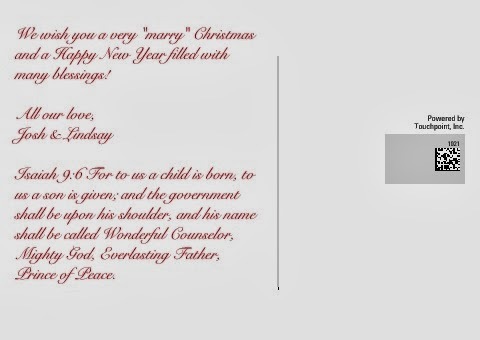 I'm so very happy to show you the Colvin's very first Christmas card! I was over the moon excited to send out our first Christmas cards! I had known since...well, let's be honest, LAST Christmas...that I wanted to use a wedding picture on our card and use the phrase "may your days be MARRY and bright". It's just too cute! So that we did, wedding picture and that phrase! 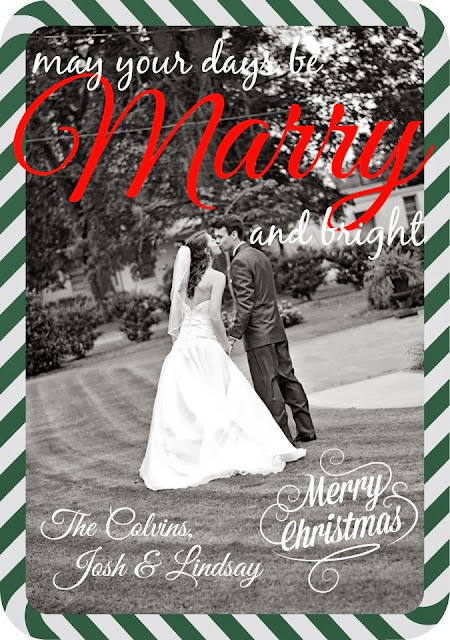 I actually made our cards on Picmonkey (just like our Save the Dates) and uploaded them to Walgreens photo center and bam, we had postcards for Christmas! Super easy and Walgreens had 40% photo cards when I ordered, so a win-win! I also think that Walgreens uses Snapfish to print their custom photocards and the quality was AWESOME! And they arrived a day earlier than I expected them to! Josh and I hope you have the "marriest" of Christmases and that blessing flow over you and your family in the coming year!